Within the manufacturing process Philips do try to ensure a high standard of quality that should limit the potential need to return for faults. From our very own hands on we can confirm that the standard of Sonicare products is very high. 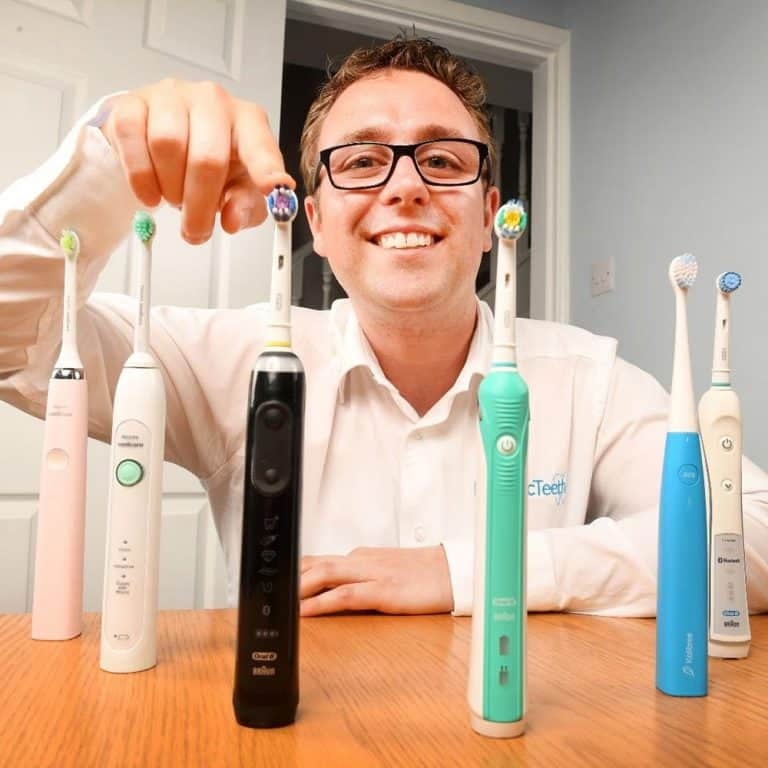 They have been manufacturing electric toothbrushes for many years, so are very experienced and this allows for a certain standard to be implemented into all products. Inevitably though being an electronic product it can go wrong. So what is the process when it does? How long is the brush covered for? You can find the answers to these questions and more below. How long is the warranty on a Sonicare electric toothbrush? The good news is that the brush is covered by a 2 year warranty/guarantee. As we understand it, this 2 year warranty applies globally, but if you are not in the UK or Ireland we advise double checking this information. Therefore, if your brush has stopped charging or won’t switch on then no problem you are covered. However one small caveat that does not seem to apply to other toothbrush manufacturers is that the battery within the brush is only covered for 12 months from date of purchase and not 24. This is not very clear prior to purchase nor included on the documentation. However, the instances where the battery is at fault are very low as the batteries tend to last a lot longer, employing a tried and tested construction and used in millions of products worldwide. The guarantee commences from the date of purchase. Buy the brush on 1st February 2019, the warranty will be valid until 31st January 2020. It is advisable to register your electric toothbrush once you have purchased it. Here you can create an account (or login if you are an existing user). You can create an account using an email address or password or even via your social network accounts such as Facebook, Twitter, LinkedIn and Google. Once you have registered and activated the account, you can select your specific electric toothbrush from the list of models and enter the date of purchase and proof of purchase. You will receive confirmation of the registration and the brush will now show within your account. From here you can gain access to supports, manuals, FAQ’s write reviews and more. Much of this is a little misleading and actually only redirects back to the original product page on the Sonicare site. You generally get the basic information but not much more than you really need. How can I get my Sonicare electric toothbrush serviced in the UK? The best procedure is to call the UK support centre for Sonicare products on: 0207 949 0240. Explain the issues you are having and they will advise based on the model and the fault. According to Philips Sonicare current procedures (which of course might change) should your toothbrush fails to work properly they can arrange a free of charge replacement of the faulty handle or charger (depending on the fault found). This allows for a swift and effective resolution to an issue you may be having. For In Warranty Service: Contact Sonicare on 0207 949 0240 and explain the fault. They will take a few details and arrange for a replacement to be sent out in most instances. For Out of Warranty Service: There is no support for customers with brushes outside of normal warranty periods. You are expected to safely dispose of the brush and purchase a new one. The process is generally very quick. Once you have logged the fault a resolution will be offered. More often than not this will be a replacement brush, but this is not a guarantee. In this instance you will be asked to provide some details and a new brush will be sent to you within few days. Is there an extended warranty option? No, Philips do not offer an extended warranty option. What is covered in the Sonicare warranty? The warranty starts on the day of purchase and runs for 2 years. If your Philips Sonicare electric toothbrush product is defective during the warranty period, Sonicare will repair or replace it free of charge. Is the warranty and repair process free? If the fault with your electric toothbrush falls under the terms of the warranty and is within its warranty period, Philips will normally for no cost to yourself send out a replacement brush to replace your faulty one. Will they collect the toothbrush? No. Whilst subject to change, you will normally not be required to send the brush back, but do not dispose of it until such times as you have spoken to Philips and made appropriate arrangements with them. How long will I be without a toothbrush? On the rare occasions a brush should falter, Philips will look to resolve the issue promptly once they become aware of it. Within a few days of logging the fault, you should have a new brush delivered to you. Will they not just replace the toothbrush? Normally yes, but this is subject to Philips Sonicare policies and whether certain conditions are met. Do I need my receipt? Retaining your receipt will be advantageous when it comes to booking your toothbrush in for any warranty repair, so it is worth keeping hold of. Even better, go online, register your brush and upload a copy of the receipt when you buy the brush and then you and Philips have a digital record of this. My electric toothbrush is outside of the warranty period can I get it repaired? No. No policy exists for repair to toothbrushes outside of warranty. I am not in the UK, where and how to do I get my brush repaired? If you are not a UK resident, but have a Sonicare electric toothbrush your brush will likely be subject to the same warranty conditions, but regional variances in policy can occur. Refer to your manual/documentation provided in the box at time of purchase for your local warranty procedure and support contact numbers. You can also find them later in this post. Is the battery in my Sonicare electric toothbrush handle replaceable? The battery inside is not really designed to be replaceable. The handle within which the battery is contained is sealed and there is no simple process to remove or replace this. Trying to do so will invalidate your warranty and likely make the brush unusable. For any faults, battery or otherwise contact your local Sonicare support team. What is the full warranty wording? Slightly confusing, there is the wording that appears on the documentation that came in the box and the wording that appears on the Philips website. Philips warrants its products for a period of two years after the date of purchase. If any defect due to faulty materials and workmanship occurs within this two year warranty period, Philips will repair or replace the product at its expense. Philips will only pay for repair or replacement if convincing proof is provided, for instance by means of a receipt that the day on which service is claimed is within the warranty period. The warranty does not cover products and/or product parts that are subject to wear that can be considered as consumable parts by their nature or that are made of glass. The warranty is not valid if a defect is due to damage caused by incorrect use, poor maintenance (e.g. parts blocked by scale) or if alterations or repairs have been carried out by persons not authorised by Philips. For the appliance to be used correctly the user should strictly adhere to all instructions included in the user manual and should abstain from any actions or uses that are described as undesired or which are wanted against in the user manual. Important warranty restrictions for certain product materials. For some products the warranty may be subject to certain restrictions, for instance as a result of the type of material used. Warranty restrictions, if any can be found under the heading ‘Warranty restrictions’ in the chapter ‘Warranty and Support’ of the user manual. These warranty restrictions do not affect your statutory rights. Support during and after the warranty period can be obtained in all countries where the product is officially distributed by Philips. In countries where the product is not distributed by Philips service is provided by the national Philips organization. In this case there may be some delay if the required spare parts are not readily available. Turn to your dealer or an authorised Philips service centre for service. Contact the consumer Care Center in your country if you need more information or if you have problems obtaining service. If there is no Consumer Care Center in your country you can contact the Service Department of Philips. Address and phone number can be found in the grey section of this leaflet. The warranty begins on the date of purchase as stated on your proof-of-purchase and expires at the end of the period indicated in the section “Warranty period” below. In case you lost your proof-of purchase, the retailer is unknown or the product was purchased from an unregistered seller e.g. via on-line auction channels, the warranty period is considered to have started three months after the date of manufacturing indicated on the product or as derived from the serial number of the product. For products without production date or serial number on the product a valid proof-of-purchase is required. Where a repair is not possible or is deemed uneconomical Philips may agree to replace the product with a new or refurbished product, at Philips discretion and the warranty will continue from the date of original purchase. The Philips warranty applies provided the product has been handled properly for its intended use and in accordance with the operating instructions. The proof-of-purchase has been altered in any way or made illegible. The defect is caused by abuse of the product or by environmental conditions that are not in conformance with the recommended operations of the product. The defect is caused by connection to peripherals, additional equipment or accessories other than those recommended by Philips. The unit has been damaged, including but not limited to damage by animals, lightning, abnormal voltage, water or fire, natural disaster or transportation. The product is defect due to wear of parts, which can be considered as wearable- or consumable parts by their nature. The product does not function properly because it was not originally designed, manufactured, approved and/or authorized for the country where you use the product, which might occur in instances where the product has been purchased in another country other than that of its intended use. The product does not function properly due to problems with access to and or connection with service providers, such as interruptions in the access networks (e.g. TV cable, satellite or Internet), faults on the subscriber’s or the correspondent’s line, local network fault (cabling, file server, user’s line) and faults in the transmission network (interference, scrambling, faults or poor network quality). In order to avoid unnecessary inconvenience, we advise you to read the user manual carefully and/or consult the support section of this web site before contacting Philips or your dealer. To obtain service within the warranty period please contact the Philips Consumer Contact Centre via chat, email or phone call. Philips contact details can be found on this website. When your product is no longer within warranty you can contact the nearest authorized Philips Service Centre directly. your product serial number or production date code as indicated on the product. The model number (also sometimes called model ID), serial number or production date code can be found in the battery compartment, or on the back or bottom of the product. Philips House, South County Business Park. For other countries, please refer to this document. The typical life of an electric toothbrush tends to be about 3-5 years on average. Now there is no hard line time frame about how long they last, but that is a rough approximation of usable life that I have come to based on my own testing and feedback from readers of the site. Most brushes come with a 2 year warranty as standard with some offering the option of 3 years, which shows how long the brands expect the brushes to last at a minimum. We have received comments from readers who have had Oral-B and Sonicare last 10-15 years. I bought a Sonicare Easyclean in 2014 on Amazon, having previously owned a Sonicare for over 10 years whose battery finally died. During the past 3 years I have had to get the handle replaced 4 times under warranty (the final replacement was actually outside the two year period and they upgraded me to a HealthyWhite as compensation for my trouble). This last head also failed recently and Philips will not replace as over two years has elapsed since the initial purchase. None of the handles has lasted more than 10 months (the shortest was 6 months) and they have been stored, used and charged as per the instructions by only one user. I have somewhat lost my faith in their product but wondered if you have any information on if any their models are more reliable than Easyclean or HealthyWhite? I really like the product and find it cleans much better than an OralB, just don’t want to spend any more money on a product that has such a limited life yet with a high price tag. I am surprised somewhat by your comments and the number of issues you have had. Of course any product is susceptible to fault, but form my experience Philips are the generally more reliable brand, but your usage would suggest that there are some weaknesses within the range. I can only speak first hand and be upfront and say personally I have had no issues with Sonicare or Oral-B for that matter and most of my experience is based on the stories of others, despite having used many brushes myself. Of course with any new brush you will get a new warranty, so should a handle fail you will be able to get it repaired/replaced as you have with the models you have used to date. Perhaps sticking to one of their better value options might be worthwhile unless you want premium features form the brush. Something like the 5 Series is at a great price presently. hi my partner bought me a sonic air black tooth brush maybe a year ago. i still have the box but no reciept. is it possible to send back to you to check it out for me as its started making a loud noise. Whilst we are not Philips Sonicare, so we cannot say categorically, but we suspect it should be possible, but you will need to speak to them to clarify. The best thing to do is call the UK support centre for Sonicare products on: 0207 949 0240. They should be then able to advise. We suspect they can go off of serial numbers etc.